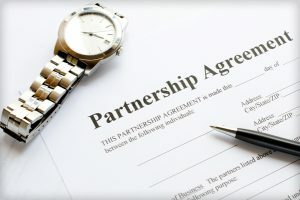 A Partnership Agreement is a contract between partners in a partnership which sets out the terms and conditions under which a partnership is governed. A partnership agreement should set out the relationship between the partners, including the percentages of ownership of each partner in the partnership. The partnership agreement should also specify how profits and losses are allocated among the partners, as well as allocation of taxes among the partners. A well drafted partnership agreement should specify the roles of the partners in the operation of the partnership. Issues like control, the duties of the partners, and management should be clearly stated in the partnership agreement. Likewise the agreement should specify how disputes among the partners should be handled and what provisions the partners have made to resolve partnership disputes. In addition, the partnership agreement should make clear who can contractually bind the partnership and what if any liability the partners have. Finally a partnership agreement should specify what happens in the event of the death of one of the partners in the partnership. A partnership agreement should set out how the procedures for dissolution of the partnership and winding up the affairs of the partnership and how to resolve conflict or deadlock among the partners.